What do you think when you hear the word "detox"? Let me guess- you conjure up formidable images of drinking potent green juices all day and shaking your head no to all of your favorite treats? If you are committing to detoxing, you have chosen a different goal from dieting. By definition, detoxification is a process of removing toxic substances or qualities. Here is my tested guide for what you can add, rather than take away, to let the detoxification begin. Seaweed- The "new kale", this superfood packs chlorophyll, fiber and vitamins. Always a fan of seaweed, I prefer to add it to a bowl of greens. Burdock Root- You digestive system's new BFF, this super-root can be found in juices and teas. It aides your digestive system, especially minimizing bloating. 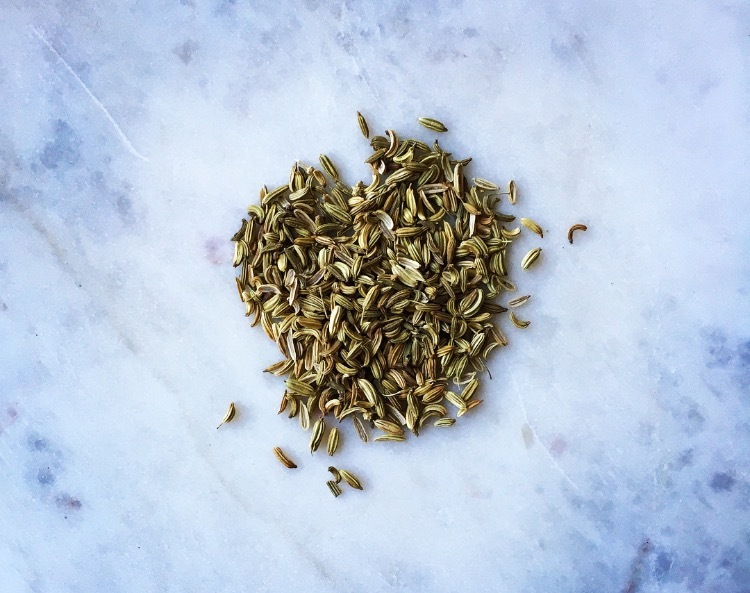 Fennel Seed- Can be grounded up in smoothies or simply sprinkled into sales and soups, fennel seed is easy to find in the spices section of health food stores. Licoricey in taste, it will also help aide digestive purification. Dandelion Root- Ever think you'd be consuming this bright little weed? This super-root is a key ingredient to reducing inflammation. I prefer adding the mild tasting extract to my tea 1-2 times a day. Peppermint Leaf- Another perfect addition to tea or even smoothies. Peppermint tea or extract in your favorite tea has a refreshing taste and benefits detoxification of the digestive system. Recently I had a holiday smoothie that included peppermint extract which was another fun way to access the leaf. Ginger- Ginger can be added to your favorite recipes for dressings, soups and juices. Try a butternut squash or sweet potato + ginger pureed soup recipe for a detoxifying lunch. Ginger tea is another way to get the inflammation reducing, antioxidant packed and intestinal settling detoxifier. Milk Thistle- This liver cleanser can be easily added to smoothies and teas by simply using its extracted form. It is one of many detoxifiers listed in this article that can be found in The Republic of Tea's cleansing line. Slippery Elm Bark- I have tried both the extract and powder of SEB. I find the powder to be more potent and work effectively. Used for years in ancient medicines, this detoxifier soothes the digestive system and aides in cleansing the system. I have heard that it is so quick working that it should not be taken around the same time as medications. Another perk which I have found to work is that SEB coats the throat and therefore can be a great addition to your usual vitamin C when trying to fight a cold. Spirulina- Packed with protein and antioxidants, spirulina has been known to detoxify our body's largest organ, the skin. Best accessed by adding the power to green smoothies. Wheatgrass- Until recently, Wheatgrass shots were my favorite energy boosting cleanser that could only be accessed at juice shops. Now I can get their detoxifying benefits whenever by keeping WOW Wheatgrass frozen wheatgrass shots in my freezer. All forms of the super cleansers in this article can be found at your local health food store in the supplements, produce or frozen food section.